An Introduction to Equilibrium Thermodynamics discusses classical thermodynamics and irreversible thermodynamics. It introduces the laws of thermodynamics and the connection between statistical concepts and observable macroscopic properties of a thermodynamic system. Chapter 1 discusses the first law of thermodynamics while Chapters 2 through 4 deal with statistical concepts. The succeeding chapters describe the link between entropy and the reversible heat process concept of entropy; the second law of thermodynamics; Legendre transformations and Jacobian algebra. Finally, Chapter 10 provides an introduction to irreversible thermodynamics. 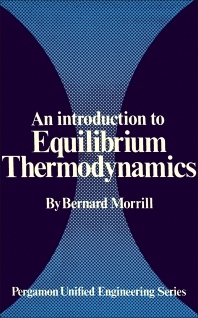 This book will be useful as an introductory text to thermodynamics for engineering students.